There has been a big jump over the last couple days in apps getting updated to run on an iPad with the iOS4.2 installed. As you may have read, 4.2 will bring the iPad up the iPhone 4 with it’s mutltitasking, apps able to process in the background, Airplay (not on the iPhone 4 yet) and have app folders in the launcher. Several apps will be taking advantage of these features via their most recent updates. Here is just a couple that we pound on daily so we are looking forward to the enhancements. • Printing – AirPrint support has been added for those users running iOS 4.2. Printing controls are accessible from the Document Browser. 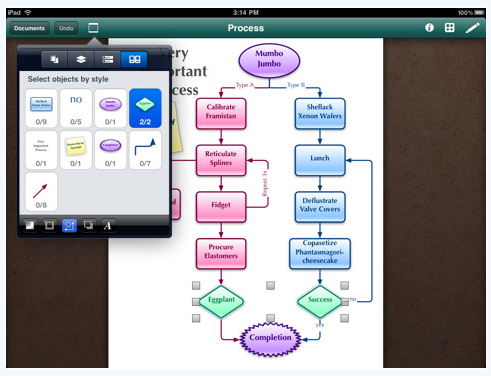 • Multitasking – OmniGraffle for iPad 1.4 takes advantage of Multitasking in iOS 4.2 to better maintain application state and perform tasks when in the background. • The ability to selectively view documents based on file type has been added, users can choose to look at normal diagrams or at custom and downloaded stencils. • The ability to change the sorting order in the Document Browser has been added as well, allowing users to view documents in a list based on title or modification date. • A scrubber of sorts has been added to the bottom of the Document Browser view, providing quick navigation from one end of the list of documents to the other. • Users are now able to create their own custom stencils from scratch. Yea!!! • The ability to selectively show and hide any or all stencils in the Stencils popover has now been added. • The Konigi Wireframe stencils now come bundled with OmniGraffle for iPad. • Support to access and write to files at a WebDAV server or MobileMe iDisk account has been added. Documents can be exported and emailed natively or as PDFs and PNGs to WebDAV and iDisk as well as to the iTunes directory for access via the desktop. 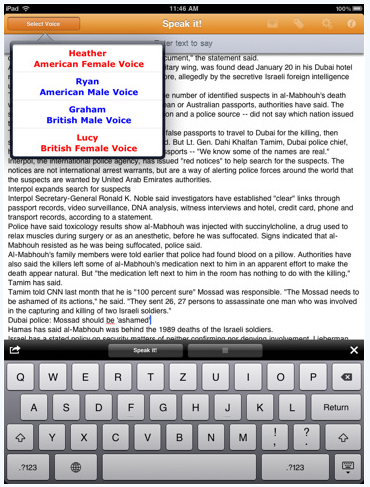 • A new and improved Font Inspector popover is in place, making bold and italic typeface selection easier, and text can now be underlined. • Various improvements to the Text Tool in Drawing Mode have been made. 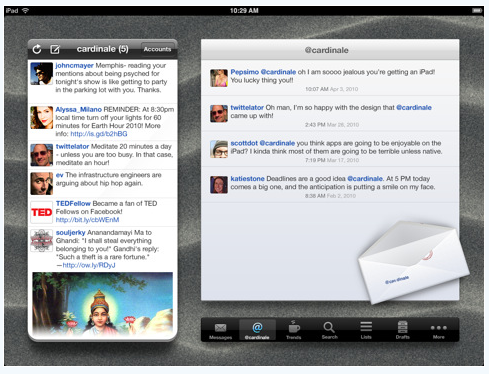 Twittelator Version 1.5: much smaller list but speed and multitasking is always good news! -ten new voices have been added for download on the Speak it! Store including Arabic, Dutch, Portuguese, Greek, Polish, Russian, and Swedish voices!